Forex and CFD broker AvaTrade has become the top choice for traders aiming to gain profits from trading the popular digital currency Bitcoin, according to ForexMinute, the leading Forex news and views portal. With the assured higher returns and lower risk, trading Bitcoin with the Ireland-based broker presents great potential in generating an increase in investments, which is the primary goal behind the introduction of Bitcoin Forex trading in AvaTrade. ForexMinute founder and CEO Jonathan Millet said AvaTrade’s higher leverages and special seasonal offers play a key role in enabling traders to patronize this broker when investing in Bitcoin. Credits are also given to the user-friendly trading platform AvaOptions, which provides Forex traders a complete range of features and exclusive offers that are unavailable in other Forex brokers. This enables the brokerage firm to make a mark in the market for its Forex trading services, according to the ForexMinute report on AvaTrade. Offering an extensive list of option expirations and the ability for traders to combine FX spot, calls and puts on one platform, AvaTrade’s fully functional trading platform allows traders to choose from more than 30 currency pairs and initiate trades with one day expiry to as long as one year. Moreover, it features the Strategy Optimizer tool, which functions to precisely present traders a comprehensive overview of the market and the risks involved with the trading strategy being employed by them in every trade. The addition of this tool results in lower risks, permitting traders to acquire higher profits from trading Bitcoin. 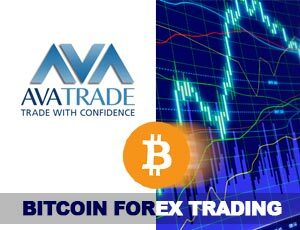 A pioneer in online trading since 2006, AvaTrade was among the first few brokerage firms that began offering Bitcoin trading when this digital currency became a top choice among traders to make money, making this Bitcoin Forex broker one of the most popular and in-demand firms that offer such trading services to traders of all levels.